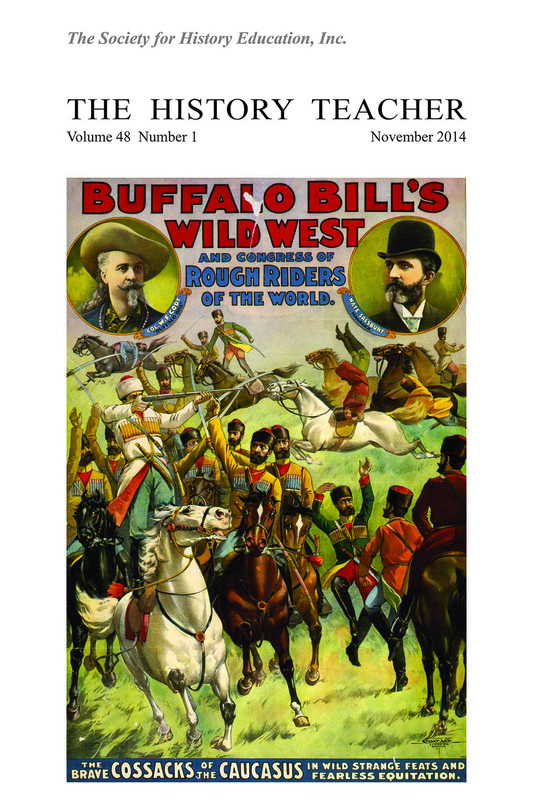 November 2014 Cover: Buffalo Bill's Wild West and Congress of Rough Riders of the World. 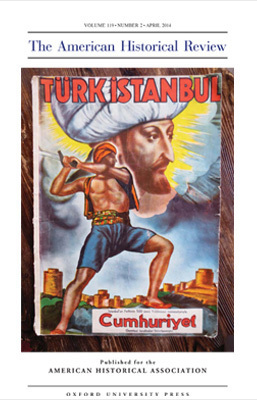 The Brave Cossacks of the Caucasus in Wild Strange Feats and Fearless Equitation. 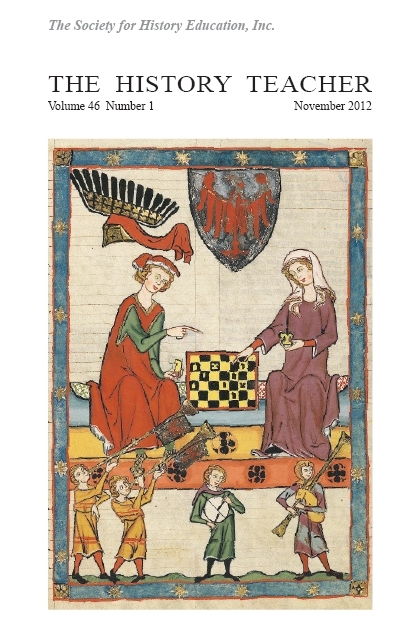 Lithograph copyrighted by Courier Litho. Co., Buffalo, N.Y., 1899. 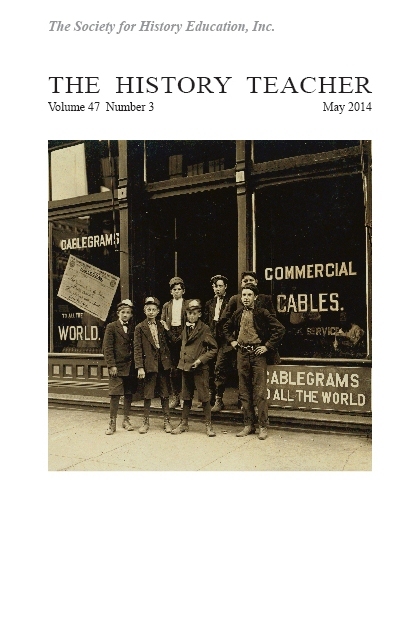 Library of Congress, Prints and Photographs Division, LC-USZC4-3170. https://www.loc.gov/pictures/item/94513623/. Back Cover: Buffalo Bill's Wild West and Congress of Rough Riders of the World. Wild Rivalries of Savage, Barbarous and Civilized Races. Lithograph copyrighted by Courier Litho. Co., Buffalo, N.Y., 1896. Library of Congress, Prints and Photographs Division, LC-USZC4-2351. https://www.loc.gov/pictures/item/93510428/. 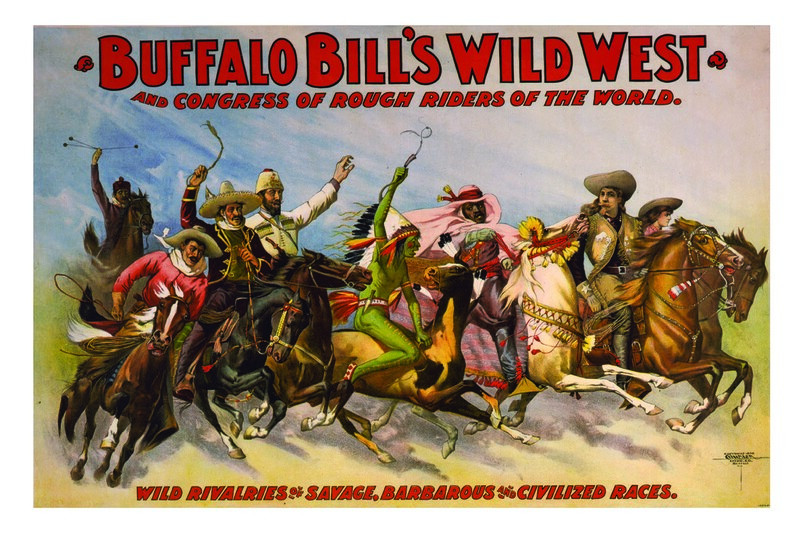 Buffalo Bill's Wild West troupe drew audiences around the globe with promises of thrilling historical reenactments, dazzling feats, and "real Indians." Emphasizing entertainment over authenticity, the performances obscured the voices and agency of indigenous peoples in order to present simplistic yet hyper-realistic "hero vs. villain" adventures. Owner William F. Cody later established The Col. W. F. Cody ("Buffalo Bill") Historical Picture Company to document the American West and reenact the Indian Wars on film. The Western and Frontier film genres continue to attract audiences to this day. 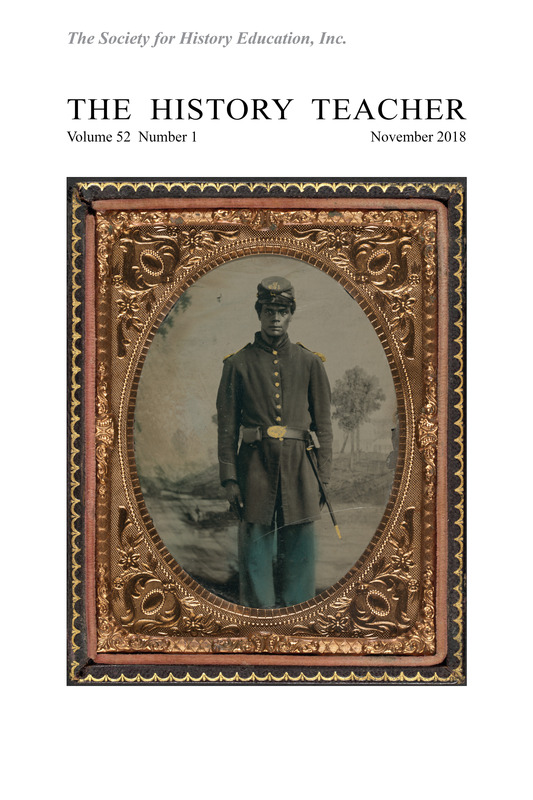 This issue of The History Teacher features Jeremy Stoddard, Alan Marcus, and David Hicks, who teach with film about indigenous peoples�as well as for and by indigenous peoples. Their article, "The Burden of Historical Representation: The Case of/for Indigenous Film," begins on page nine. Mariana Achugar earned her Ph.D. from the University of California, Davis, and is a Guggenheim fellow and Associate Professor of Second Language Acquisition and Hispanic Studies at the Department of Modern Languages in Carnegie Mellon University. Her work explores the discourse construction of the past and the development of disciplinary literacy in multilingual classrooms. Some of her most recent publications have appeared in Linguistics and Education, Discourse & Society, and Critical Discourse Studies. Brian D. Carpenter earned his Ph.D. from the University of Pittsburgh and is an Assistant Professor in the Department of English at Indiana University of Pennsylvania. His work focuses on using discourse analysis to understand learning and development in classroom interactions. Matt Earhart is a National Board Certified educator at L.C. Anderson High School in Austin, Texas, where he serves as the Department Chair for Social Studies and teaches history. Earhart was honored as the 2012 Teacher of the Year for Austin Independent School District, largely for his work in creating supports for traditionally underrepresented populations of students. Leslie W. Grant is an Assistant Professor of Education at the College of William & Mary in Williamsburg, Virginia, and teaches in the educational policy, planning, and leadership area. Her research interests focus on classroom-based assessment and teacher quality. She is involved in several research projects, including international comparative case studies of award-winning teachers in the United States and China and the efficacy of development assessment literacy in teachers and educational leaders. David Hicks is an Associate Professor of History and Social Science Education in the School of Education at Virginia Tech. His research interests include: examining the teaching and learning of history in a standards based setting; the integration of multi-media and digital technologies to support the teaching and learning of history and social science; history of education, citizenship education, disability studies, and parental advocacy. Tasha Holtman is a Minneapolis South High School senior, and enjoys doing historical research, especially on topics concerning children's welfare. 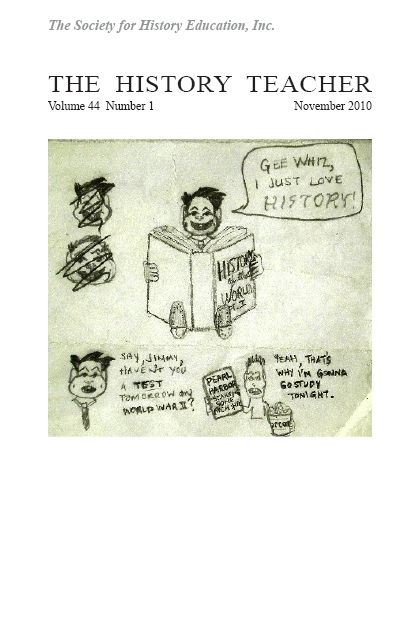 Holtman has participated in National History Day six times and won three National Contest medals. Holtman has also studied German for eight years and loves international travel and the challenge of communicating across cultures and languages. In her free time, she tutors elementary school children, plays the oboe, and enjoys the company of her family's four cats. Wayne Journell is an Assistant Professor and Secondary Social Studies Program Coordinator at the University of North Carolina at Greensboro. He received his Ph.D. at the University of Illinois at Urbana-Champaign in 2009, and his primary research interest is the teaching of politics and political processes in secondary education. Recent publications in this area include articles in Theory and Research in Social Education, Journal of Social Studies Research, and Journal of School Leadership. Eric Otremba is a Visiting Assistant Professor at Macalester College in St. Paul, Minnesota. He earned his Ph.D. from the University of Minnesota in 2012 and has published scholarly articles in Atlantic Studies and History and Technology. Prior to Macalester, he taught at the Gustavus Adolphus College. He currently teaches classes on the Atlantic world, early modern Britain, early America, Atlantic slavery, early modern science, and America's founding fathers. Alan S. Marcus is an Associate Professor in the Department of Curriculum and Instruction at the University of Connecticut. At UConn, he directs the Secondary Social Studies Education program. His scholarship and teaching focus on history education and teacher education with an emphasis on the benefits and dilemmas of film as a teaching tool and on the pedagogical potential of history museums. Jeremy Stoddard is Associate Professor of Education at The College of William & Mary and an affiliated faculty m ember in the Film and Media Studies Program. His research focuses on authentic pedagogy and curriculum in the social studies, the role of media in democratic education, and how teachers and young people engage with media in learning and teaching about history and politics. Jessica Stump is a student at Fruitvale Junior High School in Bakersfield, California. She is currently leading an enrichment program with her mother at her school, where students are working in partnership with the Fruitvale School District, Kern County Superintendent of Schools, and other local researchers in creating curriculum, resources, and special events based on her National History Day project on Henrietta Lacks and the HeLa cell. The Stumps are working with the Lacks family on literary projects, a newly founded HeLa International program, and other events to help share the story about Henrietta Lacks and her amazing immortal cells. Yonghee Suh is an Assistant Professor in Department of Teaching and Learning at Old Dominion University. She received a Ph.D. degree in Curriculum, Teaching, and Educational Policy from Michigan State University. She currently teaches elementary and secondary social studies methods courses. Her research has been published in venues such as Theory and Research in Social Education, International Journal of Social Education, Social Studies Research and Practice, and Multicultural Education.